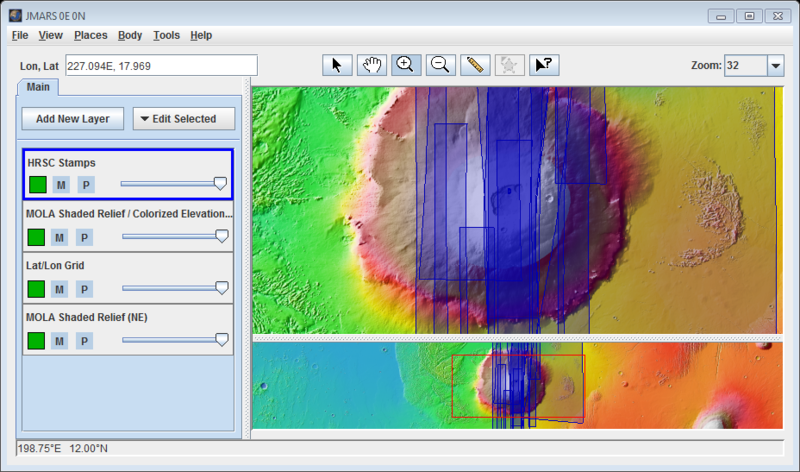 Open the Stamp Layer: Chose "Add New Layer" -> "Instrument" -> "HRSC" OR "Add New Layer" -> "Imagery" -> "HRSC" . Enter Search Parameters: It is not necessary to enter values for each parameter, but the more specific your search the faster it will be. The allowable values for each field are given in the quick reference table below followed by more detailed descriptions of each search parameter. A unique identifier for each image commanded. Spacecraft orbit during which this image was observed. By definition, orbits begin at the ascending equator crossing of Global Surveyor's polar orbit. The highest resolution in an image (meters/pixel). This is the image resolution in meters per pixel at the center of the image. For most narrow angle images, this value will be approximately the same over the entire picture. For wide angle images, the pixel scale will vary over the image. 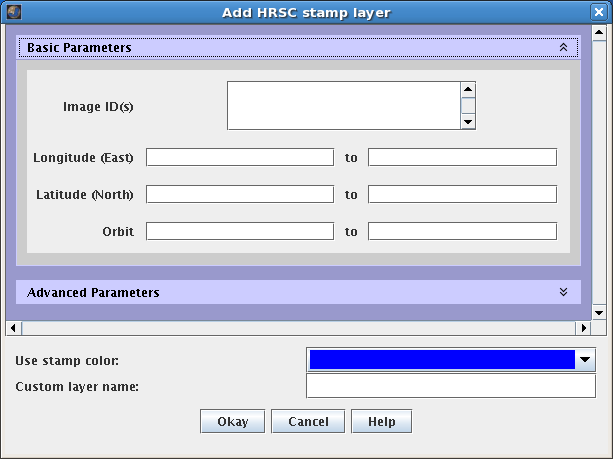 The HRSC Stamp Layer's functions are identical to the functions of the Stamp Layer and are explained in detail on the Stamp Layer page.